If you can’t get to Chicago for the Festival of Maps which is currently underway, then why not pop along to the virtual gallery of the exhibition. Navteq have recreated the Chicago Field Museum Maps exhibit in interactive 3D, allowing you to tour the rooms where the maps are hung. 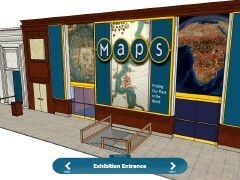 By clicking on each of the small arrows gives a short information piece about each map or globe. Why not pop online for a quick tour. Previous Article Do you blog about peer reviewed research? Next Article Pass the Tamiflu!